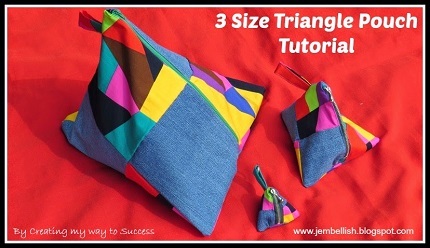 Jill from Creating My Way To Success shows how you can make these fun triangle zippered pouches. Her tutorial gives dimensions to make them in three sizes: a larger pouch that could hold toiletries, a medium sized pencil pouch, and a smaller keychain sized pouch. That itty bitty one is sooo cute! You can make just one, or make all three sizes and give the nested set as a gift. Go to Creating My Way To Succes for the tute.